More than a year ago Chandos released their first volume (CHAN 10211) of Cyril Scott's orchestral music (see reviews by Stephen Lloyd and Colin Clarke). In addition the BBC have recently broadcast the Violin Concerto and Dutton have now reached the third double volume in their complete traversal of the Scott solo piano music. Now we have the second commercial recording of Scott's art nouveau Piano Concerto No. 1. It is a lapidary piece with a tendency to decorative rhapsody, chiming mystery and chamber textures.� It�s the antithesis of the adversarial-dramatic concerto. It falls between the communing mysteries of Bax's Symphonic Variations and Medtner's Second Piano Concerto. It's not a big guns, combative heroic work in the mould of Brahms 2 or Stanford 2. The swooning meditations deepen in the second movement with its celesta and Faune-like tremor. There is ghost of a bluff Grainger-like folk song at the start of the finale but it's evanescent and the Handelian heartiness is moderated away by that oriental element. It's given a most lovingly attentive performance which at least equals the only other commercial recording on a long gone Lyrita LP (SRCS81) in which the soloist was John Ogdon with the London Philharmonic Orchestra conducted by Bernard Herrmann. The Fourth Symphony at last! I wondered if I would ever hear this piece. It was completed in 1952 when Scott's music was long sunk in a slough of neglect and opprobrium. The music variously passes back and forward through atmospheric writing typical of Debussy's La Mer, Ravel's Daphnis and Bax's Spring Fire. It also includes some wonderfully sun-warmed and leaf-dappled music typical of middle period Frank Bridge and of Suk's Ripening. Listen to the closing bars of the first movement Grazioso for the tremble of the leaves, the musical shuttle of birdsong and the fey blandishments of Bax's maenads in Spring Fire. There is a feeling of instinctive development of material � almost of improvisation. Some of this music is undeniably sombre or at least cloud-hung - portending some threat like the lichen strands in Bridge's There is a Willow and Phantasm. The finale has the pregnant Ravelian overtones of Vaughan Williams� A London Symphony in its suggestions of timelessness and of the flow of a majestic river, shifting and shiftless, focused fleetingly then unfocused. Mysticism plays like shafts of sunlight in a forest amid music that is even-contoured, fluttering and finally triumphant. A fascinating addition to the varied landscape of British music in the last century. 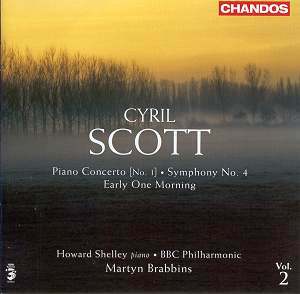 Early One Morning is a single movement piece which was recorded by Ogdon and Herrmann in their second Scott LP (SRCS82) which included both this work and the Second Piano Concerto. This is another ethereal piece sometimes recalling the John Ireland of The Forgotten Rite and Legend. It avoids anything as mundane as a direct allusion to the full melody of the folk-song on which it is based until the piano statement at 4:40. There are however floating strands and fragments of the melody. It is all wonderfully done � a movingly beautiful performance and recording in a chiming and gently ringing heat haze. This version packs a more emotional effect than the Lyrita. In a world in which the orchestral scores of Zemlinsky and Schrecker are properly enjoying multiple recordings it is well past time that this music basked in the sunlight. How tragic that Scott who died more than 35 years ago and whose 130th anniversary falls in 2009 should never have heard this work performed. We need more Scott and I hope that future Chandos discs will include the first two symphonies (1899 and 1903) as well as the other concertos and the many orchestral genre pieces. Also much to be hoped for is a series of the ambitious choral-orchestral works such as Hymn to Unity, La Belle Dame Sans Merci, The Nativity Hymn, and the orchestral Poe ballet The Masque of the Red Death. The notes are provided by Lewis Foreman whose pivotal role in the British Musical Renaissance since the mid-1960s has made a decisive and positive difference to so many rebirths and rediscoveries that have and will change the landscape of concert-goers and music-lovers across the world. A fine addition to the shelves of any collector of twentieth century melodic music.